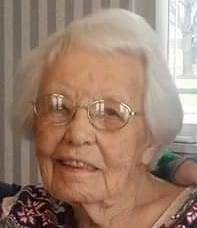 Funeral services will be held on Thursday, March 21, 2019, at 1:00 PM, at the Edgar-Grisier Funeral Home in Wauseon. Rev. Steven R. Geske will be officiating, with interment following in the Wauseon Union Cemetery. A period of visitation will take place, also at the funeral home on Thursday, from 11:00 AM until 1:00 PM. Online condolences to the family may be offered at www.GrisierFH.com. The Edgar-Grisier Funeral Home in Wauseon is honored with Rosemary’s care and arrangements. Be the first to comment on "Rosemary Lind (1920-2019)"